Work, family, bills, and other obligations and responsibilities can make stress a part of your daily life. Stress can help you get motivated, but too much stress can increase your risk for illnesses such as stroke, heart attack, and high blood pressure. Natural stress reducing activities, like gardening, can be an ideal solution to finding a peaceful balance in your life. Gardening has been shown to have many health benefits. In fact, the activity is recommended by the JAMA, or the Journal of the American Medical Association, to lower the risk of developing Alzheimer's disease by nearly fifty percent. According to Capital District Community Gardens, tending a garden alleviates stress by immersing you in nature. Gardening requires dedication, care and patience to be successful. When tending your flowers, fruits and vegetables, you are spending time on something that redirects for attention away from daily stress. Gardening also provides you with real results that you can share with family, friends and neighbors. Horticulture therapy has been used for many years as a simple, effective way to relieve feeling overwhelmed by your problems. In fact, gardens can promote a sense of well-being when tended on a regular basis. Green spaces are now also utilized in healthcare facilities to encourage healing. According to the University of Minnesota, green living spaces can lower blood pressure and reduce the amount of stress hormones in the body in less than five minutes. There are several theories about how and why natural spaces reduce stress and promote happiness. One of the best reasons to get out and grow your own flowers, fruits, herbs and vegetables is to get more exercise and to stimulate your mind. Physical exercise releases hormones that increase feelings of well-being naturally, while sunlight exposure has been shown to reduce depression among those with seasonal depression. Along with the tangible physical benefits, gardening exposes you to nature. Just being outdoors in a natural environment can be beneficial to your mental health. A small flower garden allows you to spend time in a natural scene while also rewarding you with a beautiful bouquet in the warmer months of the year. Studies have shown that even a few minutes in nature can be beneficial. You don't have to spend hours weeding and watering to feel less stressed. You can enjoy the benefits of having your own garden no matter where you live. If you live in the city, you can use a balcony for a small herb and vegetable garden. Container gardens are very easy to manage in addition to being good for your mental health. Container gardens can also be indoors. You can use traditional planters or you can look for a hanging planter that is placed on the wall in a sunny location. Living in a rural area allows you to have a much larger garden. Large gardens have the added benefit of providing you with physical exercise, which can also reduce stress, as well as enhancing your mental well-being. With a small space outside, you can reap the benefits that nature has to offer whether you have an acre to garden or just a few containers of flowers and herbs. Mark Carol is a health writer for Assisted Living Today, which is a leading resource for finding health care tips for aging adults, as well as assisted living homes. 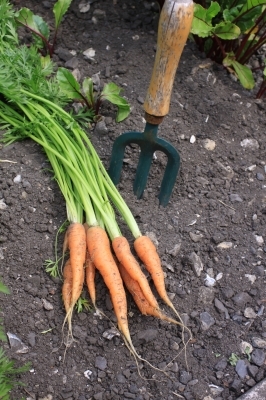 Organic gardening increases your physical activities and also helps in removing your stress. Spending time in garden, makes your mind more relaxing and diverts you from regular stress.